Frigidaire's Gallery Gas Dryer offers several features that will aid the ordinary laundry chore. Its advanced functions include a reversible door, an LED read out control panel, and faster performance via its ultra-capacity feature. Its painted steel finish gives it a sleek and stylish design pleasing to the eye. This Gallery gas dryer model offers users seven cycles that include normal, heavy, and quick modes. Drying cycles can be set from 15 to 90 minutes (times are all divisible by 15). A Tumble Care Dry System is included to ensure that fabrics remain intact after each cycle. Drying temperatures can be set to low, medium, high, or maximum. There is also a no heat or ëAir Fluff' option for clothes that don't need hot temperatures for drying. Dryness levels can be set to normal, damp dry, more dry, or less dry, letting users tailor the dryer's function to the fabrics loaded. A precision moisture sensor can be included to make the drying cycle more accurate. This sensor makes the machine stop when enough drying has been applied, saving the fabrics from wrinkles. A control lock can also be set for families that require child proofing in their homes. This gallery model is only available in classic black. The drum material and back cover is made of stylish stainless steel. The Gas Dryer has a reversible door that is easily adjusted in minutes. This feature is suitable for small laundry rooms or narrow areas. The LED screen control panel allows users to clearly comprehend the options and set the cycle and temperature by simply turning a dial. Users can leave dryer alone and just listen for an end-of-cycle signal after the drying process. Electronic controls utilize LED lights and allow users to easily adjust settings with a drying cycle knob and touchpad. 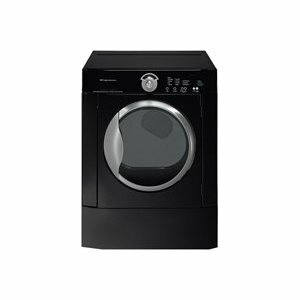 Moisture sensor option automatically turns off the dryer once the clothes have efficiently gone through the process. Better care is ensured for the fabrics. Reversible doors allow the model to fit into any kind of space. Seven cubic feet capacity provides enough space for the average household laundry load. Only four drying cycle options are offered, excluding the dryer's use to more unique fabric types. The dryer does not include a sanitary cycle option that removes bacteria from hand wash items like pillows. No steam cycle included in its drying options.